Orlando might get all the glory, and rightfully so, with its world-beating assortment of theme park thrills, attractions and dining. But did you know most people who come to Orlando actually stay in the town of Kissimmee, and the oft-overlooked area straddling the Disney is chockfull of different ways to get your thrill on. Check out our list of the top things to do in Kissimmee : Thrills Outside the Theme Parks. By far one of the Kissimmee areas most famous attractions, the Old Town Slingshot, also known as the Vomatron (you can guess why), is one of the most thrilling attractions in Central Florida outside (or inside) the theme parks. The specially designed Slingshot uses a state of the art system of springs and high-strength cables to sling riders at nearly 100 mph to a height of over 320 feet! 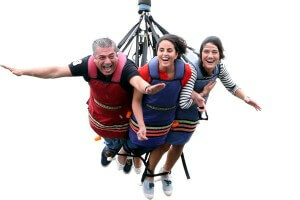 The ride seats you and a friend, and you can choose to order a video of the experience as a keepsake! Our recommendation: go with the video! YouTube is full of riders’ unforgettable facial expressions thanks to the Vomatron in Kissimmee. If you want to see Central Florida from a whole new perspective, consider taking a hot air balloon ride with one of the many established hot air balloon operators in Kissimmee. 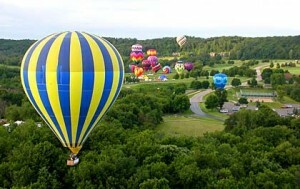 One of the most popular is Thompson Aire, which conducts hot air balloon flights 7 days a week at sunrise. Thompson Aire’s hot air balloon experience features a breakfast buffet pre-take off, and a one hour flight during which you’ll see stunning aerial views of everything from area wildlife preserves to resorts, theme parks and more. 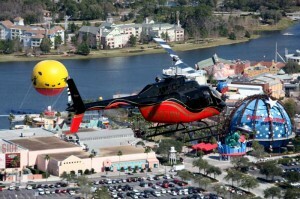 If a hot air balloon isn’t enough of an aerial adventure for your liking, you and your loved ones can embark on a helicopter tour where you’ll see scenic views of Orlando and it’s world famous attractions, all from the comfort of a state-of-the-art, air-conditioned helicopter flown by an expert pilot. These tours include flights over Downtown Disney, The Animal Kingdom, Epcot or Florida’s Butler Chain of Lakes, all of which introduce you to some breathtaking views of one of Florida’s most beautiful and diverse areas. All riders are given headsets to communicate during the flight, and you can even film your adventure for a unique memento of your trip! Warbird Adventures are reserved for the true adrenaline junkies in the family. Rather than being flown along, you’re the one behind the controls of a North American AT-6 Texan Aircraft, a propeller plane with a lineage traceable to World War II. Warbird Adventures is truly unique among thrill experiences in that you actually do the majority of the flying, with, of course, an experienced pilot guiding you along and taking over the controls for the hard stuff. 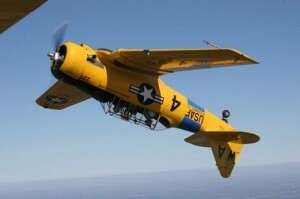 You can even choose to make it a family affair, and bring two planes up in the same formation. Ride experiences come with DVD’s and HD photos, and take it from us; this is one truly one of the most unique things to do in Kissimmee. There is simply nothing else like it! The Sky Coaster at Fun Spot America in Kissimmee is the tallest of its kind in the entire world, and at nearly 300 feet high, provides some of the biggest THRILLS of any ride in the world. The ride starts with you and a second rider being pulled up to maximum height. Then, you drop, freefalling hundreds of feet at speeds approaching 70mph, only to recover and zoom towards the other side just feet from the ground before swinging back and forth until your momentum carries your down. 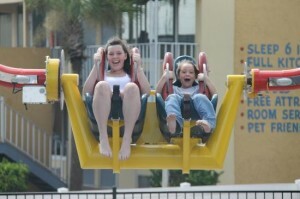 A description truly doesn’t do this Kissimmee thrill ride any justice; you’ll have to see for yourself. 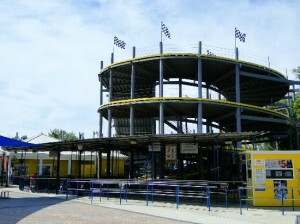 Fun Spot America features a set of 4 thrilling go-kart tracks, each with their own unique blend of twist and turns. The Conquest, Commander, Quad Helix and Thrasher courses all offer something different when it comes to racing thrills, but the most popular by far is the Quad Helix. Its patented design features dramatic, multi-story elevations and 25+ degree banks, giving it both visual and driving appeal. There are less intense courses available for younger riders as well. Do you have any questions about things to do in Kissimmee? VillaDirect Vacation Homes can help! Click to learn more about our vacation concierge services and our affordable vacation rentals, or call toll free 877.259.9908 today!